It's a curious thing about monsters: you never know which ones the public will love. The Daleks are the best-known of Doctor Who monsters/villains. In fact, they were the ones that got the ball rolling to make Doctor Who the longest-running science-fiction program in history. There are other monsters/villains which I would throw in among the Top Fifteen: Cybermen, The Master, Ice Warriors, Sea Devils, Sontarans, Slitheen, Autons even those Weeping Angels everyone seems so crazy about. Tucked in safely among them is another monster, one that had a strong impact on the public. What makes the popularity of this particular monster more fascinating is that, not counting the two-part Cold Blood (The Hungry Earth/Cold Blood), they appeared in only two stories (and one of them is in the running for being among my Top Ten Worst stories). More on them later. Cold Blood is a new marker for the revived Doctor Who; besides the ubiquitous Daleks and Cybermen, the original monsters haven't been a large part of the revived series. Yes, you've had the Sontarans and the Autons, but from my limited viewing (Love & Monsters pushed me to avoid the rest of David Tennant's Era), it appears the new team wanted original creatures as opposed to blasts from the past. I congratulate producer Stephen Moffat in not being as afraid of the classic monsters as Russell T. Davies apparently was. Davies to my mind appeared extremely reluctant to bring any of them back (minus said Daleks and Cybermen). I don't blame him for wanting to create new monsters for The Doctor to face, but I believe given that Doctor Who has such original creatures they should draw on them. That requires a delicate touch: creating something that will bring in the new fans while not offending the intelligence of those who followed the original series. Cold Blood manages to do both. We go with The Doctor (Matt Smith), his Companion Amy Pond (Karen Gillan), and her fiancee Rory Williams (Arthur Darvill) ten years in the future (2020) to Cwmtaff, South Wales (no, being an American I won't even try to pronounce it). In this town there is a massive mining operation (side note: mining operations are always dangerous on Doctor Who). Dr. Nasreen Chaudhry, (Meera Syal) head of the drilling, is investigating an anomaly: grass not native to Wales and which has been extinct for millions of years is starting to pop up, especially over new graves. She is assisted by the only family that actually lives in Cwmtaff: her assistant Tony Mack (Robert Pugh), his daughter and son-in-law Ambrose and Mo Northover (Nia Roberts and Alun Raglan), and grandson Elliot (Samuel Davies). As the giant machine plunging into the earth keeps going in, the Earth appears to strike back: creating sinkholes, one having already taken Mo and the other swallowing Amy up. Now The Doctor realizes something is digging up to the surface and all those on the surface cannot escape Cwmtaff. Taking refuge in a church, they are attacked by a mysterious creature. Deep in the Earth, Amy is in danger of being vivisected by another of these mysterious creatures. Eventually both sides have hostages: those beneath take Mo, Amy, and Elliot, while those above have Alaya (Neve McIntosh). The Doctor recognizes them as an unknown branch of the Silurians, reptilian creatures who lived on the surface before man but who fled underground from what they thought was a planet closing in to collide with Earth but what turned out to be the Moon being pulled into the Earth's orbit. The Silurians take the mining operation as an attack, and decide to strike back. With both sides holding prisoners, the Doctor attempts to negotiate between them two things: a hostage exchange and co-existence. Due to misunderstandings, a thirst for war, xenophobia and general fear this does not work out. At the end, we get more hints about that damn crack that are much more menacing...and we get death and even noble sacrifices for love. I don't know if this was in the mind of writer Chris Chibnall when he wrote Cold Blood, but I couldn't help think there was an analogy between the Silurians and Earthmen and that between the Arab & Jewish Palestinian. Both claim a certain territory as their own (and their own territory exclusively), both believe the other is the occupier/threat to their existence, both cannot come to a peaceful coexistence, and both hold hostages. My mind kept going back to captured Israeli soldier Gilad Shalit when I thought of both Alaya and Mo/Amy/Elliot as well as the idea of hostage exchanges. Alaya's twin sister, Commander Restac (Neve McIntosh again) the Silurian General, refers to humans as "apes", and it's an unfortunate thing among some Arabs that they use the same terminology on their Hebrew cousins (it should be remembered that they are from different branches of the same Semitic family tree...remember Abraham?). Chibnall does give extremely clever lines of dialogue in Cold Blood, specifically giving insight into the Doctor's galaxy-view. "No weapons. It's not the way I do things", he tells Ambrose when they capture the Silurian. He shows he's not fond of how humans deal with new threats. Of course, he's equal opportunity: when informed of the arrival of the Silurian military, he remarks, "There's always a military, isn't there?" I'd like to think that Cold Blood does what great science-fiction does: place modern-day issues in a fantasy world where they can be discussed more openly without being overt. I admit that the Arab/Jewish struggle playing into my thinking of the story may be my own interpretation, but the fact that I can draw analogies without being lectured about what to think of them elevates the episode into a higher level. That isn't to take away from the adventure of it: there are many moments of thrills and chills. The scenes where Amy is literally swallowed up by the Earth is quite frightening, but not as frightening as when we see Elliot being held. That would be extremely terrifying to a child, bringing the terror to a more personal level. The performances of the guests are impeccable. Meera Syal is just brilliant as Dr. Choudhry. It's a credit to British multiculturalism to have an Indian-Briton woman lead the investigation. She creates a fully-rounded character: one who is knowledgeable, intelligent, and with emotions like love playing into what she does. Her parting scene is one of the most heartbreaking and beautiful of the series/season. Nia Roberts' Ambrose is a conflicted woman: torn by love and hate, fear and oddly hope. She never loses the balance between the emotions tearing at her: fear for her family's survival vs. her fear of the other. Samuel Davies' Elliot could have been either a whiny kid or one of those plucky sidekicks, but instead he's a regular boy who is intelligent (any child who quotes Sherlock Holmes is a winner in my book) and frightened. McIntosh has the unenviable duty of playing two characters, and while both are extremely antagonistic and I'd argue the villain you always buy that Alaya and Restac are two different, to use the Doctor's term, Homo Reptilia. (Side note: you could argue that both Silurian AND Homo Reptilia may not be the exact correct term for the creatures, but then that is being FAR too picky). Curiously, I noticed that Smith was now fully immersed into the character of The Doctor in his physicality. There were certain moments in Cold Blood when this now 27-year-old moved like a 900+ year-old. The way his back is arched while walking, the way he holds his hands, the way his head looks like it's about to tip over, the way he moves--they have an "old-man" quality. I don't know if this is Smith's own idea or that of director Ashley Way, but it isn't too distracting. In fact, I'd argue it adds to his interpretation: not so comical as Troughton, as daring as Pertwee, as moody as Eccleston or as whimsical as Tennant, but as almost puzzled by everyone's behavior. He constantly tells everyone to do exactly as he says (almost no one ever does) but while he gets upset about that he seems perplexed as to why they never do it. Gillan goes into a more "damsel in distress" manner in Part 1, but in Part 2 she returns to form, taking more charge of the situations. Her best scenes are when she faces more loss and her efforts to not forget--very deep, intense, and well-played. On a personal note, I'm beginning to feel sorry for Rory: without giving too much away, this is the second time I see him die. It may be because Darvill (and Rory) have grown on me: starting as a bit of a bumbler/wimp in The Eleventh Hour and Vampires of Venice, he grew to be more courageous and more intelligent as he progressed. It's a credit to the writing and Darvill's interpretation that has allowed us to see this growth. Credit should also be handed out to Make-Up Designer Barbara Southcott for her excellent work on the Silurians. 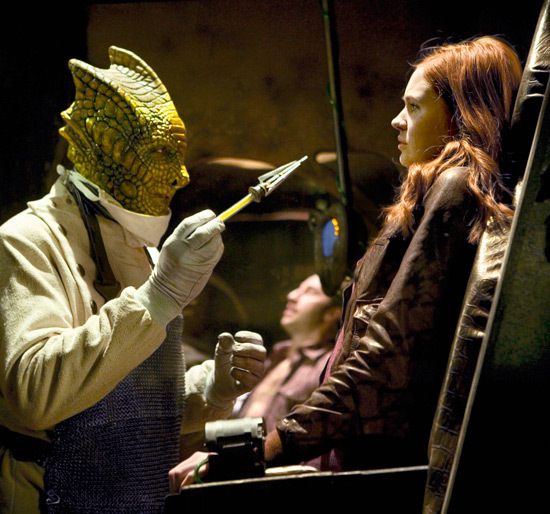 (Side note: Chibnall was wise to add in his script business about this being a 'different form' of Silurian, since they look very different than from the original series). The make-up looks realistic (ie. like reptiles) and never overwhelm the visuals. Edward Thomas, the Production Designer, created wonderful-looking sets for the Silurian underground city. At first, you don't think they are that spectacular, but as the story progresses you see both the beauty and functionality of their world. If there are things to criticize, it would be that when we get the Silurian P.O.V., it was too reminiscent of the Dalek P.O.V. I also would take it to task in its portrayal of Ambrose's actions: I think it was a little too simplistic to put it all on her, almost to the point where she because almost solely responsible for everything. I think her motivations were more complex than presented. One thing is for certain: Cold Blood is one of the darker stories of the season/series. In fact, I think it might be the darkest story so far. Perhaps, finally, I should make peace with that damn crack...it's haunted me since The Eleventh Hour and has rarely not appeared, so it's all building up, but I hate seeing it over and over and over and once more. Still, these are minor points that don't take away from a well-acted, well-written, well-directed, well-created story. Cold Blood is a very rich and deep story which will have you digging further into it (pun intended). This is the original Silurian from the Third Doctor story Doctor Who & The Silurians (oddly, the only Doctor Who story where the words "Doctor Who" formed part of the title). They returned alongside their "cousins" the Sea Devils in the Fifth Doctor story Warriors of the Deep.